I know it’s not even Labor Day here in the states but I am already transitioning into a fall state of mind. I mean, after all, Pumpkin Spice Lattes are back at Starbucks and if you ask me that marks the start of fall. I have some really great craft & recipe posts that I’ve already been working on and I’ve been pinning away on Pinterest for some major fall inspiration (I’ll let you know when that board goes public!). This is one of my tried-and-true fall recipes and I typically make it now because it’s perfect for the end of summer too… I think they’d make a wonderful dessert option for the holiday weekend! These tiny pie crusts are made from a french pastry made even more delicious with the addition of citrus zest, are filled with a tart cranberry filling and topped with a pillowy meringue. This is a great option if you’ve never attempted making a pie from scratch and just want to ease into things… they’re baked right into muffin pans! Another plus to these is that you can make the pies ahead of time then all you have to do the day of is add the meringue! The pie crust dough can even be made up to 3 months ahead of time as long as you freeze it… in the fall I make a bunch of it and just keep it in the freezer so I’m always prepared! Start off by making your pie crust, which is a citrus variation of pâte sucrée and makes enough for one double crusted pie, two 8″ or 9″ tarts or in this case we’ll use half of it to make one dozen mini pies. In the bowl of a food processor pulse together 2 1/2 cups all-purpose flour, 1/4 cup granulated sugar, 1/4 tsp salt, 2 tsp finely grated orange zest and 1 tsp finely grated lemon zest (1). Add in 1 cup (2 sticks) cold unsalted butter that’s been cut into small pieces and pulse until a coarse meal forms (2). Add 2 large egg yolks that have been lightly beaten and 2 tbsp heavy cream (or water) (3) and pulse just until the dough starts to come together which should take no more than 30 seconds. If it’s too dry, add one more tbsp at a time and pulse. Divide the dough in half, pat it into discs (4) and wrap in plastic wrap (remember you only need one disc for this recipe!). Refrigerate for a minimum of one hour, up to 2 days, or freeze for up to 3 months. Preheat your oven to 375F and roll out your disc to 1/8″ thick on a lightly floured surface. 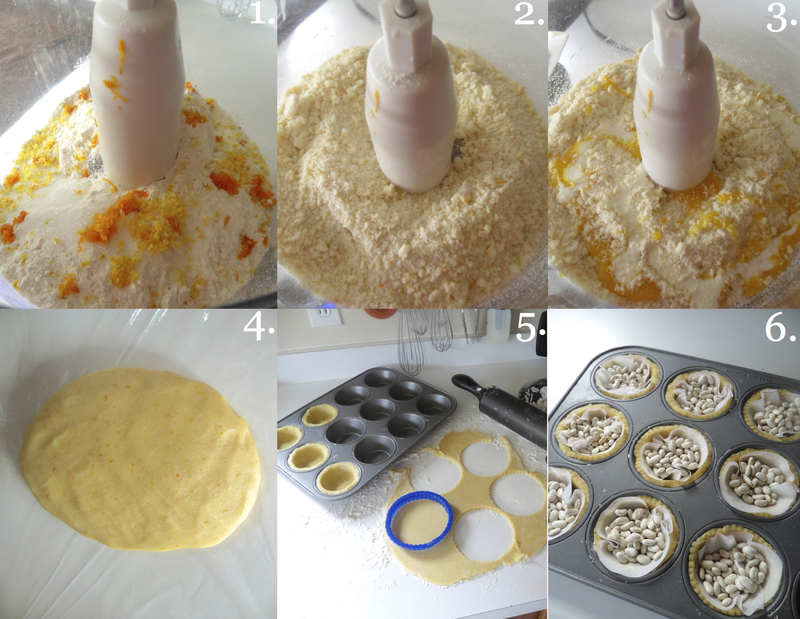 Cut out twelve 4″ fluted rounds and fit into the cups of a standard muffin pan (not non-stick) (5). Dock the bottom of each one a couple times with a fork and refrigerate until firm, about 30 minutes. Line each one with a small parchment round and fill with pie weights or dried beans (6). Bake for 15 minutes, remove parchment and weights then bake until the bottoms are just turning golden, about 5 minutes more. Transfer the pan to a wire rack and let cool for 5 minutes, remove the shells from the pan and allow to dry completely. To make the filling: Bring 2 cups cranberries, 1 cup sugar and 1 1/2 cups water to a boil in a medium saucepan (1). Reduce the heat to a simmer, stirring occasionally, until the cranberries burst, about 5 minutes. Pour through a fine mesh sieve set over a bowl (2) and push through with a spatula, discarding the solid in the sieve. You should have about 1 3/4 cups juice now, if you don’t just add water. Wipe out the saucepan and put the cranberry juice you just made back in it along with 1/4 cup sugar, 2 tsp lemon zest, 1 tsp blood orange zest, 1/4 tsp salt, 1/4 tsp cinnamon, 1/8 tsp cloves, a pinch of nutmeg and 1 1/4 cups cranberries (3). Bring to a boil, reduce to a simmer and cook, stirring occasionally, until the cranberries are soft but not burst, about 3 minutes. Meanwhile combine 3 tbsp cornstarch, 1/4 cup fresh blood orange juice and 1/4 cup water in a bowl. Whisk into the cranberry mixture in the saucepan and bring to a boil stirring constantly. Cook, stirring, until translucent and thick (4) and divide filling among pie shells. Refrigerate until set, 1 hour or up to one day. To make the meringue, whisk together 3 large egg whites and 1/4 cup sugar in a heatproof bowl set over (not in) a pan of simmering water until the sugar has dissolved and the mixture is hot to the touch. With an electric mixer, beat on medium speed until foamy and then raise to high speed and add a pinch of cream of tartar. Beat until medium glossy peaks form and divide evenly on the tops of the pies. 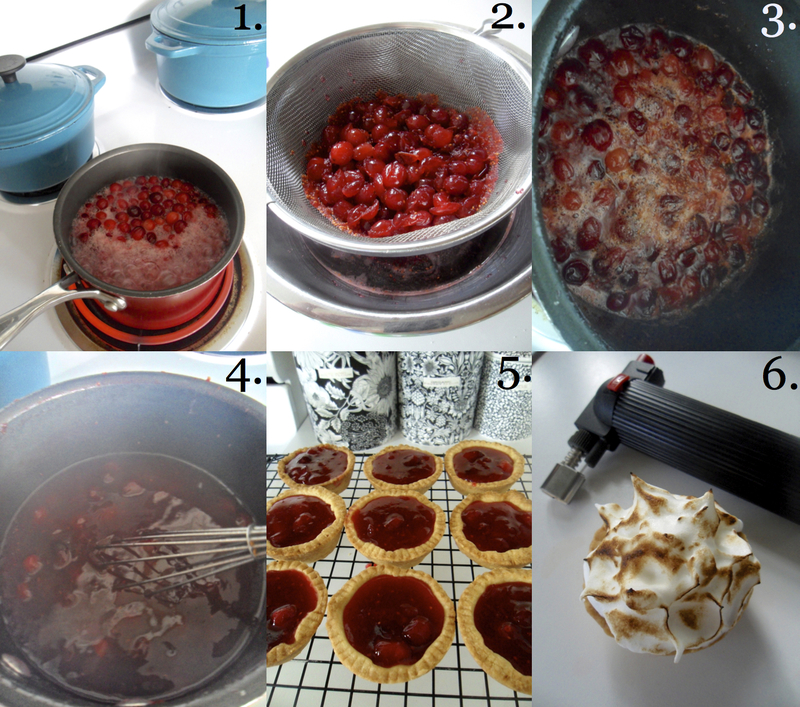 Use a kitchen torch to lightly brown the meringue peaks (6). If you don’t have a torch, you can put them under an oven broiler for 30-60 seconds watching carefully to make sure the meringue doesn’t burn! Start off by making your pie crust, which is a citrus variation of pâte sucrée and makes enough for one double crusted pie, two 8″ or 9″ tarts or in this case we’ll use half of it to make one dozen mini pies. In the bowl of a food processor pulse together flour, sugar, the zests and the salt. Add in the butter and pulse until a coarse meal forms. Add the egg yolks and 2 tbsp of the heavy cream and pulse just until the dough starts to come together which should take no more than 30 seconds. If it’s too dry, add one more tbsp at a time and pulse. Divide the dough in half, pat it into discs and wrap in plastic wrap (remember you only need one disc for this recipe!). Refrigerate for a minimum of one hour, up to 2 days, or freeze for up to 3 months. Preheat your oven to 375F and roll out your disc to 1/8″ thick on a lightly floured surface. Cut out twelve 4″ fluted rounds and fit into the cups of a standard muffin pan (not non-stick). Dock the bottom of each one a couple times with a fork and refrigerate until firm, about 30 minutes. Line each one with a small parchment round and fill with pie weights or dried beans. Bake for 15 minutes, remove parchment and weights then bake until the bottoms are just turning golden, about 5 minutes more. Transfer the pan to a wire rack and let cool for 5 minutes, remove the shells from the pan and allow to dry completely. To make the filling: Bring 2 cups cranberries, 1 cup sugar and 1 1/2 cups water to a boil in a medium saucepan. Reduce the heat to a simmer, stirring occasionally, until the cranberries burst, about 5 minutes. Pour through a fine mesh sieve set over a bowl and push through with a spatula, discarding the solid in the sieve. You should have about 1 3/4 cups juice now, if you don’t just add water. Wipe out the saucepan and put the cranberry juice you just made back in it along with 1/4 cup sugar, the zests, salt, cinnamon, cloves, nutmeg and 1 1/4 cups cranberries. Bring to a boil, reduce to a simmer and cook, stirring occasionally, until the cranberries are soft but not burst, about 3 minutes. Meanwhile combine cornstarch, blood orange juice and 1/4 cup water in a bowl. Whisk into the cranberry mixture in the saucepan and bring to a boil stirring constantly. Cook, stirring, until translucent and thick and divide filling among pie shells. Refrigerate until set, 1 hour or up to one day. To make the meringue, whisk together egg whites and sugar in a heatproof bowl set over (not in) a pan of simmering water until the sugar has dissolved and the mixture is hot to the touch. With an electric mixer, beat on medium speed until foamy and then raise to high speed and add cream of tartar. Beat until medium glossy peaks form and divide evenly on the tops of the pies. 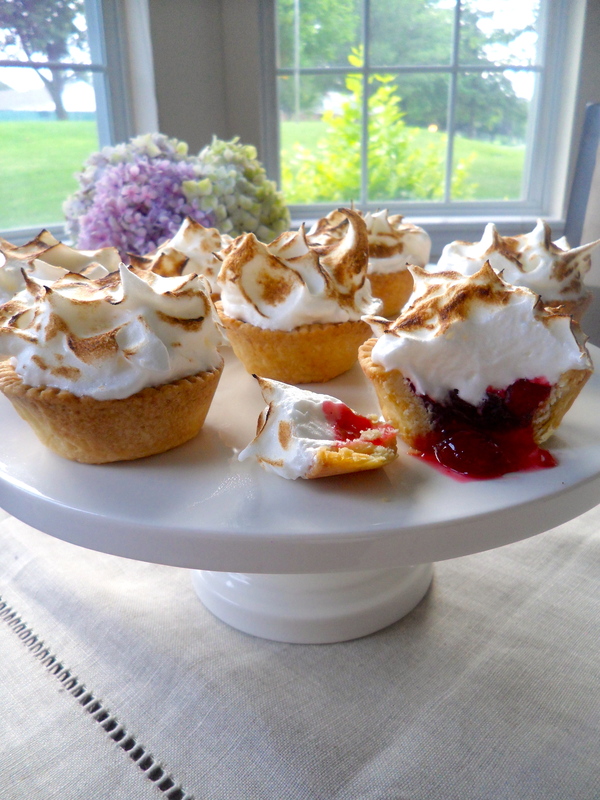 Use a kitchen torch to lightly brown the meringue peaks. If you don’t have a torch, you can put them under an oven broiler for 30-60 seconds watching carefully to make sure the meringue doesn’t burn! So beautifully photographed and explained. They look so tasty! Thanks! I am not really good at baking but I will definitely try this one. looks yummy! This is a nice recipe to help you ease into it! Much less intimidating that a full-size pie!